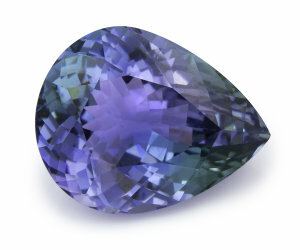 A carryover of Tanzanite mining, Peacock Tanzanite is a rare, untreated version of the well known Zoisite. The green to greenish-blue color zoning is due to the trace element Chromium. Peacock Tanzanite is a beautiful blend of purple, blue and green that resembles the captivating colors of Peacock Feathers.